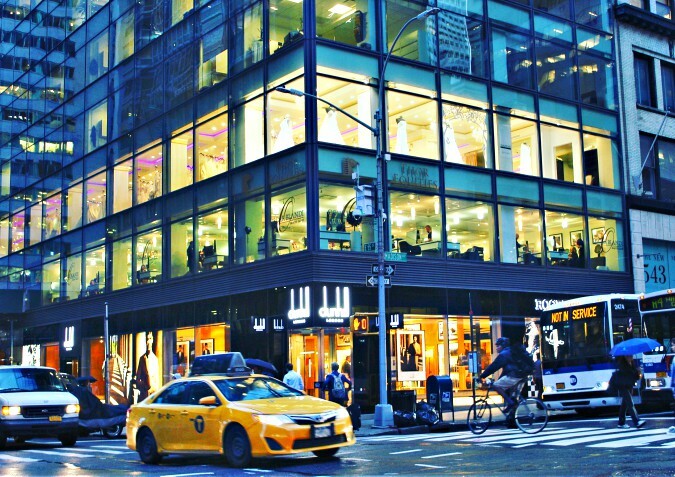 What most people perceive who have never visited and explored New York City, is that it only consists of concrete sidewalks filled with fast-walking pedestrians; massive buildings made of either brick, stone, or steel and glass; and congested streets of horn-honking cars, buses and taxi cabs. Which yes, those things are a part of New York. However, there are also many charming and quiet neighborhoods, and peaceful pockets of nature that enables city dwellers to take a break from all the noise and visual stimulation. 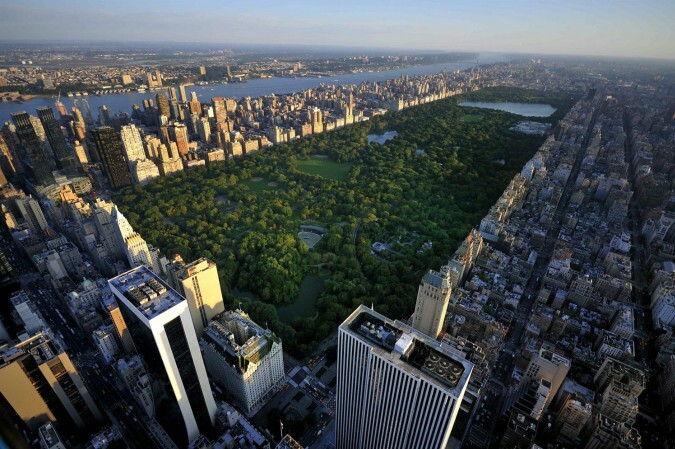 And one of those places is Central Park, which spans 843 acres. While in New York City earlier this month, my friends wanted very much to walk through Central Park. 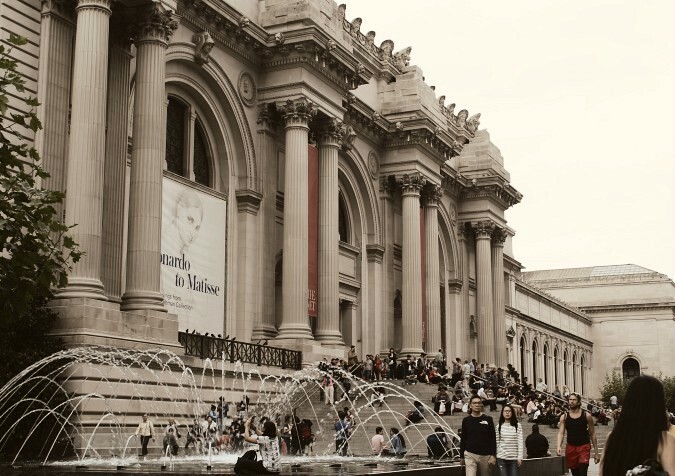 We started our trek at the Plaza (on the corner of 59th Street and Fifth Avenue) and then proceeded to The Metropolitan Museum of Art (The Met) which is on 80th Street and Fifth Avenue. The Bethesda Fountain and Terrace has been a location featured in so many television shows and movies. This is probably one of my favorite landmarks of New York City. The ladies sitting on the edge of the fountain. A rear view of the fountain. 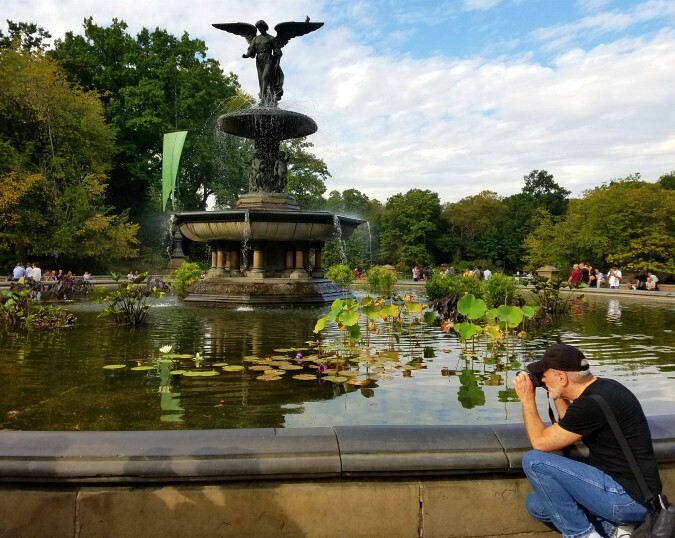 Unbeknownst to me, one of my friends took this photograph with her cell phone while I was taking a photograph of a lily pad in the fountain. When you look at these next two photographs you would never think that you were in New York City, but rather a serene park in the suburbs, miles and miles away from urban life. Within Central Park (along East 74th Street) there is a classic sculpture of Alice in Wonderland. I desperately tried to get a photograph of the sculpture without anyone sitting on it so that you could see the sculpture clearly, however there wasn't a single second when it was not being sat upon. Do you see the woman in the upper right hand corner of the picture, perched behind Alice in Wonderland? Well, you would have sworn she was a supermodel posing for a Vogue magazine cover because her husband kept taking picture after picture of her in FIFTY MILLION different poses until he got the perfect shot. And it only took him like FOUR HOURS to do it! 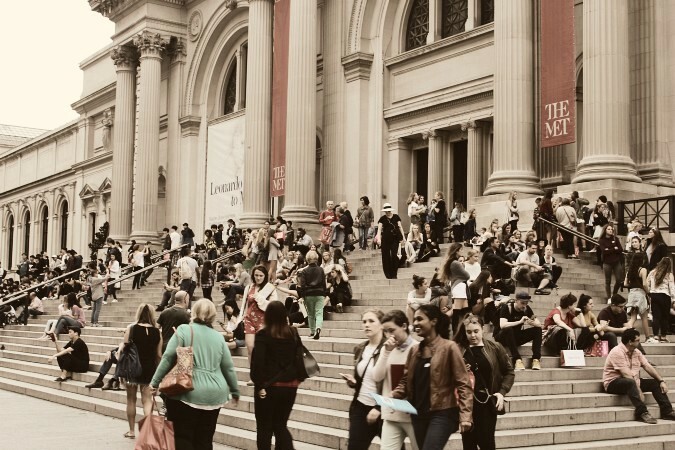 The Met stairs, at anytime, you will see this many people sitting on the steps - yup, it's pretty much a New York tradition. I spotted this woman and her dog (and young grandson) on the stairs. Isn't that dog such a cutie? 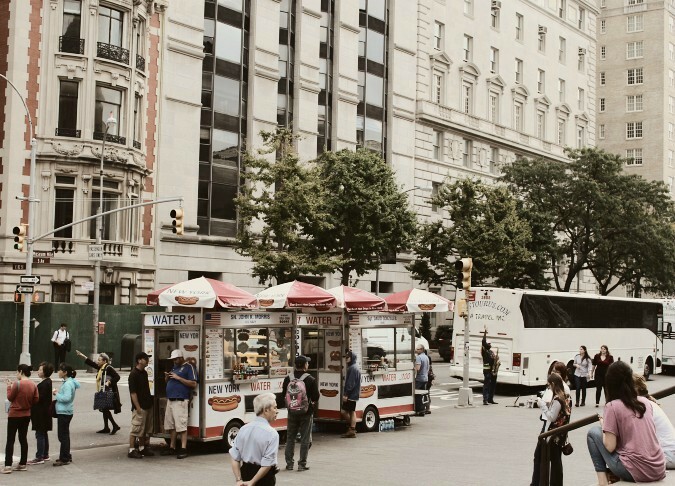 Food vendor carts along Fifth Avenue in front of The Met. One of the many things I love about this city is people-watching. It's something you can always do for free in New York, yet you feel as though you're doing something you paid a fortune to witness because it's such a rich experience. I used to work for Chanel, so when I saw this woman sitting there wearing a Chanel ensemble, I had to snap a picture. Do you see the arrow pointed at the building in the above photograph? Well, that was where Jacqueline Kennedy Onassis lived in New York City. She moved into that apartment on the Upper East Side (1040 Fifth Avenue on the 15th floor) after President John F. Kennedy was assassinated in 1963. She initially purchased the apartment for $250,000. After she passed away, it was sold for 9.5 million. What I find so incredibly attractive about New York City is that it's a stunning collage of vintage architecture mixed with modern. When you take a moment or two to look "up" while walking through the streets of Manhattan, you will very often discover some of the most interesting images to photograph. This little doggie looked up at me at the perfect moment when I snapped this shot. What a sweet precious face! The corner of 55th Street and Madison Avenue at about 5:30 PM., just after it began to rain. Thank you so much for taking this two-part tour of New York City. Have a grrrrreat weekend, y'all! I loved this, Ron. Thank you so much for reviving memories of Fifth Ave and Central Park. Of course, in the limited time I had there I only touched on the high spots but what I did see is etched in the old memory. I wonder if the guy eventually got a good picture of his wife... grins. In an effort to tidy the house and get rid of some of Joe's stuff, I came across the gift I bought him the first time I visited New York. It was aftershave, never opened, still in it's outer wrapping. I haven't thrown it out either! Central Park is so much fun to explore. I have never seen the Alice in Wonderland statue! And yes, so annoying when people hog photo ops like that couple!!! Have a super weekend, Ron! Ron, thank you for letting me tag along on your trip to NYC with the girls! I felt like I was there, minus the traffic and city noises, of course! You must have taken those photos of the doggies with me in mind -- they look just like they want to be hugged! Dallas would NOT like his mama cheating with those city dogs. 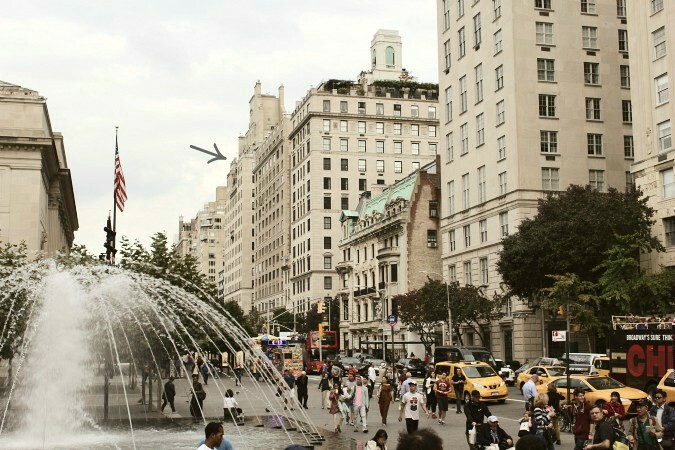 The fountain, the Met, the people and activity ... all splendid! Looks like you had a great day for exploring. Gee, I had no idea Central Park was that HUGE!! And how timely that you should include a photo of the exterior of Jackie's home! Ron, I've never seen an aerial image of Central Park showing just how HUGE it is. Wow...that is one massive park. Also in that photograph, you get a sense of how long and narrow New York City is, just like an island. As always, dude, your photographs ROCK! You clearly know how to capture the energy of the city. 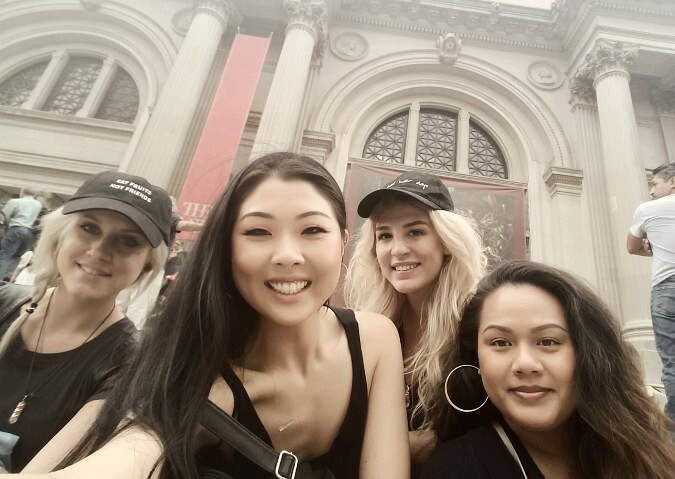 Love the editing you did of the pics at The Met. And that final shot of a rainy Madison Avenue is awesome. The color is so cool! LOL! Ron, I laughed out loud about the supermodel posing on the Alice in Wonderland sculpture! That was so funny. "It's something you can always do for free in New York, yet you feel as though you're doing something you paid a fortune to witness because it's such a rich experience." Perfectly said, and I couldn't agree with you more. 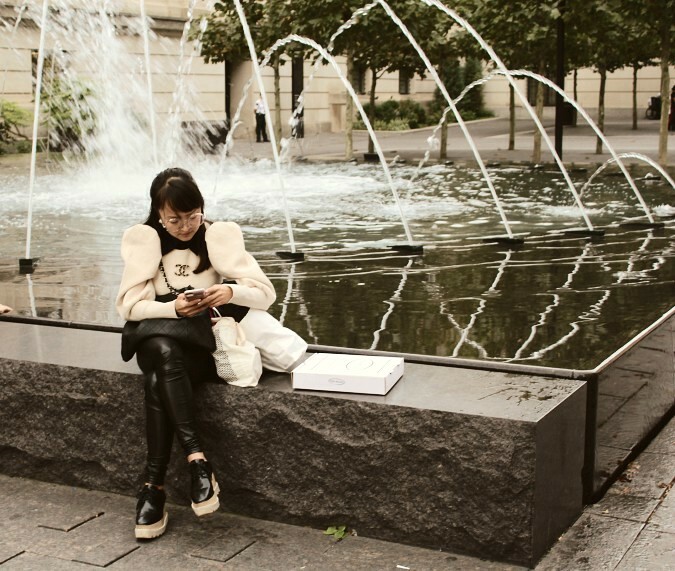 You can be doing nothing in NYC except people watch and yet feel like you're doing so much. Fantastic photos, Ron! Love the pictures of the dogs. Yes, it sure is! And it funny because for as many times as I've been there, both having lived there and visited...I always see something new! "I have never seen the Alice in Wonderland statue! And yes, so annoying when people hog photo ops like that couple!!!" OMG....they took FOREVER!!! My friends and I finally just walked away because we were got so tired of standing there, waiting to take a picture without anyone on the sculpture. Thanks so much for stopping by, my friend. Have an super weekend as well! 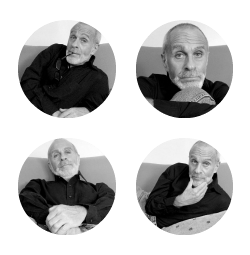 "Of course, in the limited time I had there I only touched on the high spots but what I did see is etched in the old memory." Yes! Aren't the sights and sounds of New York City amazing? Because no matter how long it's been since anyone has been there, the memories stay etched in your mind forever. "I wonder if the guy eventually got a good picture of his wife... grins." HA! Hopefully....because for as LONG as it took them to "get the perfect shot" he could have photographed SEVEN Vogue magazine covers!!!! It took him FOREVER!!! "I came across the gift I bought him the first time I visited New York. It was aftershave, never opened, still in it's outer wrapping. I haven't thrown it out either!" OMG...that's wonderful! I wonder if you did open it, would the scent remind you of your trip to New York? Yes, I wouldn't throw it out either. Thanks so much for stopping by, dear friend. Have a fantastic weekend! I was wondering when you'd post the rest of your trip photos! Central Park is such a wonderful respite for NYC dwellers. All urban areas need some pockets of nature so a person can refuel their soul. NYC has such a rich history...it's much more than simply an "urban jungle." I really love the juxtaposition of the vintage and modern architecture shot. Which do you prefer?! I sorta like vintage with all the modern conveniences! Too much humanity for my preference, but you did a masterful job in documenting the lighter side of the city....especially with all those lovely faces who accompanied you on this trip! Take care and have a wonderful weekend. OMG...my friends and I were like, "HOW LONG ARE YOU GOING TO TAKE TO GET THAT PERFECT PHOTOGRAPH?!?!?!?!?!" We finally just walked away and went to The Met. "You can be doing nothing in NYC except people watch and yet feel like you're doing so much." Exactly! That in itself is such an incredible experience that it feels like you're doing so much. Aren't the doggies cute? I can't get over how many people have dogs in New York City. It's a very dog friendly city. I found that aerial picture online and decided to use it. One day however, I plan on visiting the Top of the Rock at Rockefeller Center and taking my own photographs of Central Park from that view. I may go back next month and pay the price ($34.00) just to do it because that's something I've never done in all the years I lived there. It's a stunning view! Thanks :) It had just started to rain when I took that shot. We were lucky that day because the rain didn't start until later in the day. And even so, it was a very light rain. Aw....you're so welcome. And thank YOU for tagging along. "You must have taken those photos of the doggies with me in mind -- they look just like they want to be hugged! Dallas would NOT like his mama cheating with those city dogs." HA! You're are absolutely right! I did have you in mind when I took those doggie photographs. Aren't they so huggable-looking? I love the fact the New York City is so dog-friendly. You'd be surprised by how many people have dogs in that city. It's awesome!
" And how timely that you should include a photo of the exterior of Jackie's home!" OMG....yes, isn't that strangely timely? I took that photograph on October 11th, never imagining that all this information about Kennedy's assassination would be all over the news these past two days?!?! "NYC has such a rich history...it's much more than simply an "urban jungle." I really love the juxtaposition of the vintage and modern architecture shot. Which do you prefer?! " I ironic you mentioned the "history" of New York because I just recently watched a wonderful 4-Part documentary on the history of New York. I learned so many things I never knew about the development of that city. And I agree with you 100%....I prefer the "vintage" with all the modern conveniences! And even though I lived there at one time and visit at least once a month from Philadelphia, I still see things I've never seen before. Ron, you have such a special way of bringing the energy of New York City alive in your posts through your words and photographs! I can so totally sense how excited you are to be moving back there next year and I'm excited and happy FOR you. Wonderful photographs! 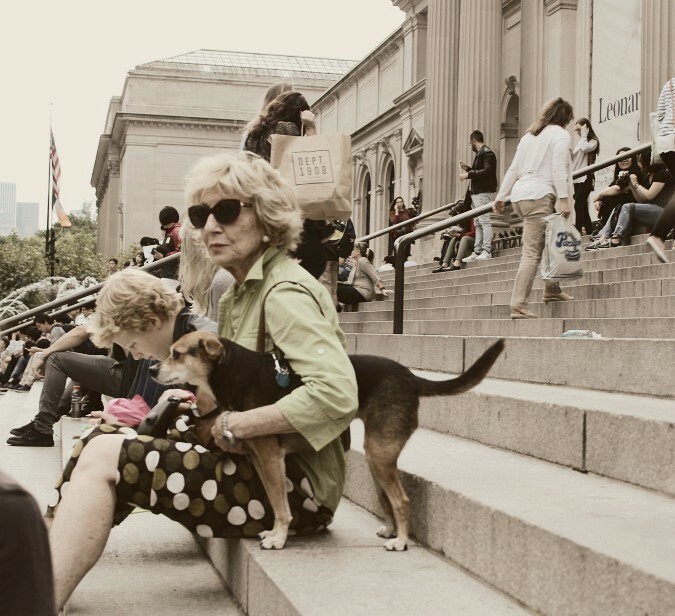 I love especially love the ones at The Met and the images of New York City life because you captured it so well. I didn't know you had worked for Chanel?!? What did you do at Chanel? I have a Chanel handbag that my aunt gave me for Christmas one year. It's the classic quilted black bag with the woven-in leather chain straps. I've had it for years and it still looks like new! Thanks for sharing the second part of your day trip into the city with the girls. I was waiting! Yes, I am sooooooooo excited to be moving back to New York next year, can you tell? HA! I've been investigating different areas I want to live. I've been checking online for apartments and what they cost. I also have some people who already live in New York checking for me as well. I worked for Chanel for 6 years as a makeup artist. I worked for them as a free-lancer for 3 years and then I worked as an in-house makeup artist for Chanel in Saks Fifth Avenue in Florida. I LOVE the classic Chanel handbag design, it's so classic and chic! Thanks so much for stopping by, girl. Hope you're having a faaaabulous weekend! Ron, isn't Central Park incredible? It's so big that you can't even see it all in one day. Bethesda is one of my favorite landmarks as well, especially the angel fountain. There is something almost sacred about it, isn't there? That last picture of Madison Ave is outstanding. The lighting you captured is so beautiful! Yes, it sure is, Daniel! I used to live on 65th Street between Madison and 5th Avenue, so I would often take long walks in the park. I don't think back then I realized just how blessed I was to live in that area and so close to Central Park! "especially the angel fountain. There is something almost sacred about it, isn't there?" Yes, there IS something very sacred about that fountain, I agree! There is a very special energy surrounding Bethesda. Thanks. I got very lucky with that shot. The sun was starting to go down so it was getting dark, therefore I had to shoot fast. Thanks so much for stopping by, Daniel. Hope you're enjoying a super weekend! Oh Ron that is so cool! I love Chanel makeup. I used to use their blush, lipstick and foundation. My girlfriends thought I was crazy to spend that kind of money on a foundation but to me it was worth is because they have the best colors and formula. And it looks so natural! I agree, Denise....Chanel are the BEST and worth the price!!! I used to tell customers to spend the money on the foundation first because that's the most important part of makeup. Thank YOU for being our virtual tour guide! Someday we'll meet up in person and you can walk us around and I'll even let Tara take a billion photos of me posing on the Alice in Wonderland statue. Aw...you are so welcome, Mark :) And yes...yes...yes...someday I know we'll meet up in person and you, Tara, and I can walk the city. I have a feeling you'll both LOVE it! "and I'll even let Tara take a billion photos of me posing on the Alice in Wonderland statue." HAHAHAHAHAHA! You GO, Mr. Supermodel!!!! Thanks so much for stopping by, buddy. Have a faaaaaaabulous week! Central Park is a lovely - and much-needed - oasis! Yes, it sure is, Fiona! An oasis smack dab in the middle of bustling city! I'M BACK! I have missed lots of your posts and have to go back to see them all! I have to say... you are in your element in New York!!!!!!! The people,, the buildings, the photos!!!!! I always love love love love the photo posts you do. My favorite is your handsome self taking a picture of the lily pads. It really made my night to see you! Chanel.. WOW. I have never owned anything Chanel - and that lady was decked out! Did she see you take her photo? The story of the statue was so funny.... His wife was BEEEAAAAUUUUTIFULLLLLLLLl so he needed a million pictures ha ha ha!!! No worries, my friend, I know and completely understand how busy you've been attending your health and getting well. But I have to say, I was VERY happy to see that you had posted a view days ago because you've been very missed.
" I have to say... you are in your element in New York!!!!!!! The people,, the buildings, the photos!!!!! " HA! I know, can you tell? And this is why I am so looking forward to moving back there next year, at the end of August. I can't wait to be back living in my favorite city! Once I move there, I would love to meet up with you in the city if you should ever decide to take a visit. I would love to walk around the city, taking pictures with you. I think you would love taking pictures there because there is so much to photograph. No, she didn't see me taking her photo. But that's one of the wonderful things about taking pictures in New York, people honestly don't care if you take pictures of them because they're used to it because practically everyone is taking pictures. Thanks so much for stopping by. So GREAT to see ya! Another fantastic post about New York! Ron, the city MUST hire you to do tourist promotions! You're the city's biggest booster! Your talent as a photographer brings out the very best in some of the city's most beloved landmarks! Great job, buddy, and I'm counting the days until you're a New Yorker once again. I was talking about New York City to a customer a few days ago and mentioned that I have plans of moving back there at the end of August and they they said that they could tell, just from the passionate way I talked about the city that New York is were I need to be. And they were right! I can't wait to move back, and am looking forward to next year. Yahoooooooooooo! Loved the visual tour of NYC! I can understand why you enjoy this city so much. There are certainly many, many things to see and do for all ages. We have only been a couple of times, but might have to put it on our list of places to explore a bit more some day. As you know, NYC is a city that I ADORE. And you shared....so many thing to see and do for all ages. For as many times as I've been there (and lived at one point), I still haven't seen everything. The best time to visit is right after Thanksgiving because all the Christmas decorations are up. To me, New York looks extra special during the holidays. I am soooooo looking forward to finally moving back then next year! Thanks a bunch for stopping by, neighbor! One gorgeous scene and photo after another. You really do have a great eye when it comes to taking photos. Just out of curiosity, are your two blond friends sisters? They sure look like it in the 12th photo. Pat, thank you for your supportive and encouraging words, I really appreciate that!
" Just out of curiosity, are your two blond friends sisters? They sure look like it in the 12th photo." No, but you're right....they DO look like sisters. And it's funny you mentioned that because they were at one time, roommates.